It's just another manic Monday, dear readers, but Europeans can once again take solace in the week's download offerings. This time around we have the continuation of a popular puzzle series, a new puzzle IP, some rather fun 16-bit Mega Man and a scattering of other goodies including one terrific discount on the 3DS eShop. Let's get to the details. Mega Man X2 (Capcom, €7.99 / £5.49) — The second part of the popular 'X' Mega Man spin-off series arrives on the Wii U in Europe this week, and it introduces some new abilities in the battle against the Mavericks. We'll see how it stacks up against its predecessor in our upcoming review, but until then you can read our recommendation in the original Mega Man X2 Virtual Console review. This is the US version of the game. Picross e3 (Jupiter Corporation, €5.00 / £4.50) — The latest in the popular puzzle series arrives in Europe later than expected, but will nevertheless be welcome to fans of the franchise. It delivers plenty of familiar challenges, though the doubled-up brain-teasers of Mega Picross add a little extra to this entry; we gave this one a solid recommendation in our Picross e3 review. Secret Agent Files: Miami (Joindots, €7.99 / £6.99) — Well hold on there, kids! This adventure game has some sass, with a Mature rating that warns of "suggestive themes", "strong language" and "crude humor". Won't somebody think of the children? This appears to be an adventure / object finding experience, but we have a suitably-aged member of staff on the case. Wakedas (CIRCLE Entertainment, €2.99 / £2.50) — This presents plenty of puzzles that could be described as one side of a particularly complex Rubik's Cube, as you move rows and columns of coloured squares to align them properly. It's relaxing to play, though isn't afraid to ramp up the difficulty, and we awarded 7/10 in our Wakedas review. Madagascar 3 & The Croods: COMBO PACK (NAMCO BANDAI Games, €34.99 / £28.49) — As the title suggests, this is a double pack including The Croods: Prehistoric Party and Madagascar 3: Europe's Most Wanted. That's your lot Europe. Let us know what you plan to download in the poll and comments below. Isn't Lego Marvel Super Heroes suppose to be out this Friday? Or is it not available as a download? PICROSS E-3!!! Woop, about bloody time! A permanent discount for Splintercell already? Ouch. I'm glad they realised Splinter Cell Blacklist was wayyy over priced. May pick it up soon. Oh well, I guess just Picross for me then. @cornishlee : All versions have already plummeted to $29.95 at retail in Australia (US$28.05, UK£17.50, EU€20.95), so ouch indeed. I love the fact that a game like this has been made available on Wii U, but it's not the sort of game that I would ever have an interest in playing, I'm afraid. The Megadrive 3D classics have been dated for the last five or six weeks in the year. And I wanted Mega Man II on GB. Already have X2 and don't have a Wii U.
I can finally play x2 hurray! @sillygostly I kind of agree, although probably for different reasons. If Hitman released on the Wii U I'd buy it day one but the all-American-heroness of this title puts me off. Tbf it was horrendously overpriced on eShop to begin with. @MadAussieBloke Redback spider? You might just wanna throw your 3DS away and get another one. As for the topic, it's kind of cool that Madagascar 3 and the Croods has a double pack, I think it's the first 3DS game to have two retail titles bundled on one cartridge. last time i ever buy one of their games at launch. £55.99 I paid for splinter cell only a couple of month ago and I've hardly played it. Thats a rip of almost £20 I could have spent on something else!!!!!! Where's X2 for NA!?! Hopefully soon. They better release X2 in NA this week. As for me, though, nope, nothing at all. I just want Flipnote on my 3DS and start animating stuff. Nice to see Picross e3 arriving. Those are great games and the pricing is also alright. 3DS Virtual Console being ignored once again. This is really getting to be a pain! Aww... I was hoping for GB Mega Mans. Nothing for me this week. 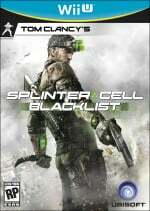 Splinter Cell was overpriced anyway but its the removal of the local co-op that killed it for me. Still disappointed about the VC's glacial pace, but I'm definitely getting Mega Man X2 should it come to the Americas this week. What's the point in discounting Splinter Cell from £55 to £45? It was horrendously overpriced and still is! Can get it for £20 physical and you can get any brand new game physically for £30-35. This should have been reduced to under £30, even then it would be expensive. I am still boycotting the eshop until there is a unified account system. Mr Whitehead can you please add a "boycotting eshop until Nintendo sort unified account system" option to your poll from now on please? Was expecting the DLC case for Ace Attorney 5. Next week it is then. Finally Picross E3! Will pick up MMX2 for sure as well. YOU LUCKY EUROPEANS! I've been after X2 on Wii U for forever! Hope it comes over here this week. I would hope that the sooner X2 comes, the sooner X3 comes. I don't know if it'll happen or not, but here's hoping! €70 for any game is crazy. It seems to be their new pattern: release a game way overpriced, then bring it down to what a full-price game should be and call it a discount. €45 is still too much for me. I have a big backlog of games that I don't have time to play, so I only tend to buy games once they're €20 or less. I'll skip Picross e3 this time, it no doubt repeats the mistakes of lacking a "try it out" mode for free mode, and has a maximum puzzle size of 15x15 again aside from a gimmicky mode like Micross. Mega Man X2 in the States better be this week. I want Mega Man 5 GB (never released in Europe), I´ve already played trough 1-4. Just release those already. X2 is great too, I´m still in 2nd part of the final stage thoigh. I will get Picross e3 for sure. And I have to say that Secret Agent Files: Miami have me intrigued. Will wait for a review though. Where is Wii U Party? Finally gunna get a chance to play X2!....if it comes to NA this week, that is. I've been waiting for the WiiU VC version since I don't have Wii shop credits anymore, so I'm super excited that it might arrive for us too! @MadAussieBloke I've got the money, it's not being able to afford it that's the issue. £45 for a digital game is insane when a brand new physical copy can be purchased for £19.99 and the absolute most you can find it for in any store is £35. I wouldn't feel any different about this if I was a millionaire. Also even PS4 and Xbox One games are £40-50 in the UK at most, just to let you know how ridiculous it is to ask this amount for Splinter Cell on Wii U. Even those will drop soon as launch game prices are always high. I'm sorry games are so expensive in Australia and I hope Nintendo and other companies get their act together over there but I don't think the solution to hugely overpriced games is to get a better job! Going to get World Conquest looks awesome. @PorllM Publishers don't control the import taxes/vats. Publishers are not setting the price to charge one region more than another. The prices are higher because these regions government, the price difference is to compensate for the local laws, the publishers still bring the exact same money they do from people in England and Australia, but the government eats that difference up. @element187 Oh I sure hope so. Seems logical to me, due to the connection of both Zelda titles. That would mean, however, we'd need SNES VC, what we haven't gotten yet. @element187 I didn't blame publishers at all? I was talking about the ridiculous overcharge that Splinter Cell is digitally compared to the physical version, not the difference in price between countries. If Ubi can sell ZombiU for £15.99 they can sell Splinter Cell for a reasonable price. Iwata: "I feel that we have not been able to take full advantage of our assets yet, so we would like to enrich our Virtual Console lineup." Splinter cell still too steep. The original price was ridiculous though. I'd be glad to support Ubisoft but what can you do when you have a limited budget. Ahh, I saw the title and thought it was going to be the rest of the Mega Man Game Boy games. Of course X2 is a dad-gum masterpiece so I'm not complaining at all. Oh boy, it's a Megaman! Im sure nintendo can point out that it is infact 2006 and those indy games are a long way away im so very sorry for my brashness. Wait now they have two game combos available for download too? Heh reminds me of the GBA era. Mega Man X2. Hell yes. @Yasume "maybe next week" has this been site's unofficial mantra since 2006. No good games this week? Maybe next week. It was repeated for weeks in a row. @JohnG: At least you guys have City Connection & River City Ransom. You're 2 NES games up on NA. @KnightRider666 Don't forget they have Blaster Master on 3DS too. @Giygas_95: You mean the GBC enemy below, right? @KnightRider666 No, they have the original NES title on 3DS as well as Enemy Below. They're getting close to having the NES game a year while we haven't even seen it on 3DS yet. Damn them! I want that too! It's another "meh" week for me. Yup, Iwata is all talk sadly. This is dismal, they truly don't care. Does this mean that NA will get MMX2? Idk what nintendo is doing keeping the SNES and GBA titles off of the 3DS! Saving potential sales for a rainy day I guess? Instead the 3DS gets Secret agent: Miami (not hotline miami). The 3DS weekly games are unfortunately weak. SEGA 3D CLASSICS say no more sort it out nintendo of europe.